Meet Franz Kafka, conflicted cop, wide-eyed cynic, hapless investigator on an odyssey across the Navajo reservation, pursuing a perplexing murder case. Quixotic cop Franz Kafka’s small-town routine is disrupted by a mysterious death at Chimney Rock. Navajo cop Robbie Begay joins the murder investigation, which leads the mismatched duo across the reservation into the victim’s fraught past, to associates whose lives are overshadowed by heinous crimes, cunningly camouflaged meth-merchants and sweet-natured squash-growers. The killer, it turns out, lurks much closer to home. Region: Fictitious small town Milagro/San Matteo County; Rural American Southwest & Navajo Nation. The Quality of Mercy is Part I of the Milagro Mysteries trilogy exploring cultural diversity in the Southwest. Part II, Lacandon Dreams, focuses on the fictional Milagro’s Mexican American community, with wider reference to the historical socio-cultural legacy of the conquista. 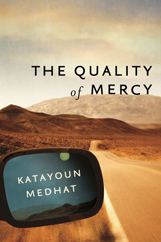 Katayoun Medhat was raised in Iran in a multicultural household and experienced her first significant cultural shock at a Catholic convent boarding school in rural Germany. She studied anthropology in Berlin and London and meandered through a variety of occupations and organisations. Working in a residential adolescent psychiatric unit—which she now realizes was the sanest place she ever worked in—taught her much about individual resilience, the restorative power of groups and the human capacity to temper adverse experiences with humour. She went on to train and practice as an intercultural psychotherapist before embarking on a PhD in medical anthropology, which led her to the Navajo Nation. She lives in Brighton, UK, and does field work several months each year in the American Southwest.